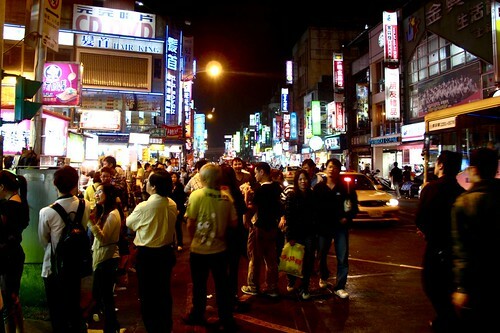 Why is the Shilin night market one of the best night markets in Taiwan? Cheap, yet DELICIOUS, eats would definitely be at the top of the list of reasons. 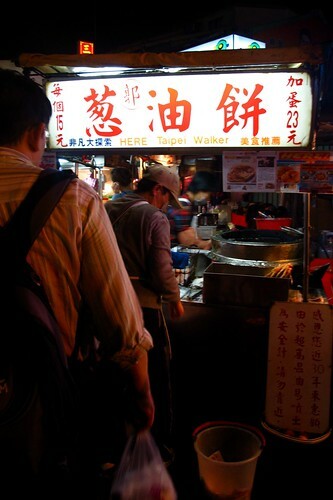 It is also one of the biggest and most famous night markets in Taiwan--encompassing many little alleyways, buildings, and even a newly constructed indoor food court. 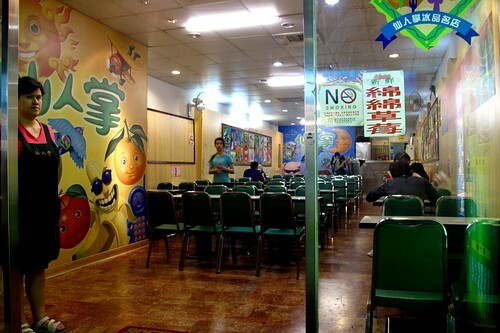 I have never been inside the indoor food court although it seems to be a very successful mix of modern amenities and traditional street fare. There are more than enough street vendors outside to keep me occupied and satisfied. I would say no trip to Taiwan is complete without a night at the Shilin night market. It really is quite an amazing experience. I also love the Shilin night market for sentimental reasons. 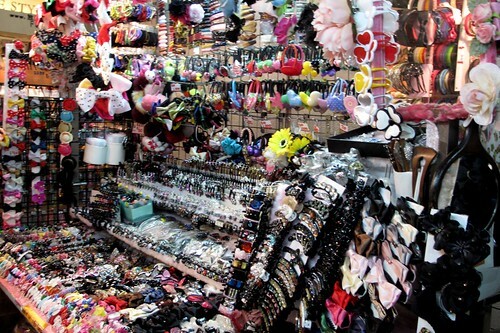 There is a stand that sells every imaginable kind of hair tie, hair clip, hair band...basically all hair accessories under the sun. I've been using hair ties from that stand for who knows how many years. When I go, I buy enough hair ties there to last me a year. Are they better than the ones you can get anywhere else? Maybe not, but I refuse to use ones NOT from that stand. There are stores here that I always walk into. There are ones that I never do. 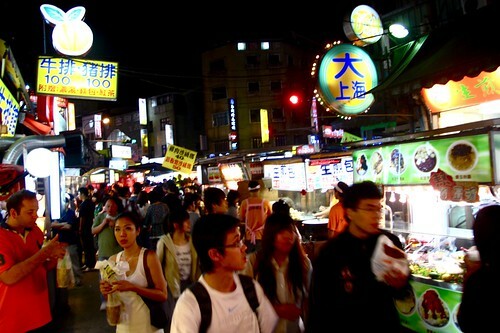 I've been to this night market so many times, there are places that I walk to compulsively. I have so many childhood memories here. I remember one especially humid summer night. I had been begging my mom to take me to the night market--I had wanted to look at all the little trinkets there (This was before my obsession with food, but not before my obsession with little things that are cute) Finally, my mom caved and we drove all the way from our house to the night market. Five minutes after stepping outside the car I was dripping with sweat from the heat and humidity. Five more minutes of pushing through the huge crowds of other sweaty people and I looked at my mom and said, "I think I'm ready to leave now." 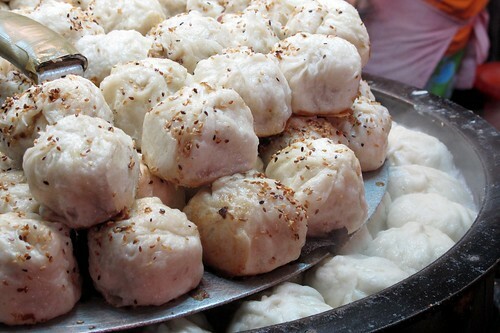 There is, without a doubt, a plethora of sights and smells and raunchy looking foods to try at the night market. I am not about to claim that I have tried them all. Heck, there are still some parts of the night market I have not yet explored. 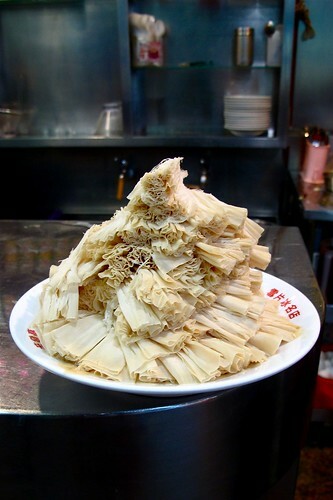 However, the following food stands that I'm about to disclose are a few of my favorites--the stuff that I absolutely HAVE to eat each time I'm there...the stuff that YOU absolutely have to have if you're ever at the Shilin night market. Blurry, I know, but it was difficult taking a picture of it while walking during nighttime. I couldn't waste time stopping and finding appropriate lighting. I had to attack it before it got cold! Pig blood cake. 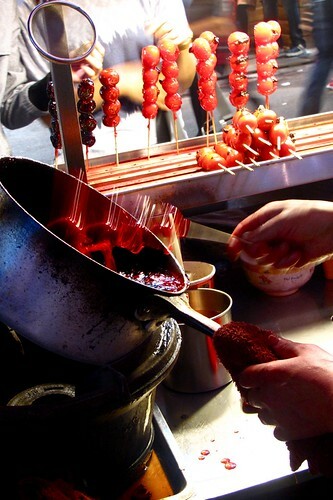 Pieces of pig's blood and glutinous rice on skewers pulled from a wooden steamer, dipped in soy sauce pasted and brushed-on hot sauce, takes a tumble in some peanut powder before a sprinkling of cilantro. If no one told you this was pig's blood, you wouldn't know. You'd preoccupied with how delicious it is. Following something hot and salty, we need something cold and sweet. 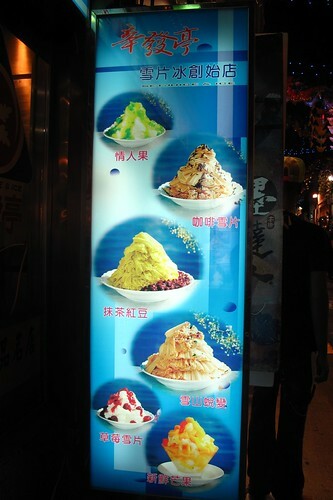 Time for some "snow flower ice" or "snow flake ice." I have no idea what to call this in English. Essentially it's shaved ice, but shaved much finer into "sheets" of ice. Also, it's not really ice made with water...it's more like frozen blocks sweetened milk. Thus, the resulting bowl of shaved ice is a creamy, sweet pile as light and fluffy as freshly fallen snow. They offer flavors other than milk (the original) including coffee, peanut, green tea, and some others. I always go with the milk flavor topped with some condensed milk and stewed red bean. This is the best bowl of shaved ice you'll EVER have. I have yet to have better anywhere else. Look for the shop with the line out the door. Trust me. Stand in that line. The shop across the street with essentially the same menu and absolutely no line might seem tempting but don't do it. Always go where the line is. I feel bad for the shop across the street but there is a reason why one is packed and the other is essentially empty. It just doesn't cut it. My mom and I went in there one time and were so disappointed, we had to eat another bowl at the better shop right after. No time for breaks at the Shilin night market. There's too much to eat. After that icy bowl of milky sweet goodness, I'm ready for something salty again. This time, in the form of a GIANT piece of fried chicken. GIANT. This thing is the size of my face. On busy nights, the line for this stand overflows on to the street, potentially impeding traffic. 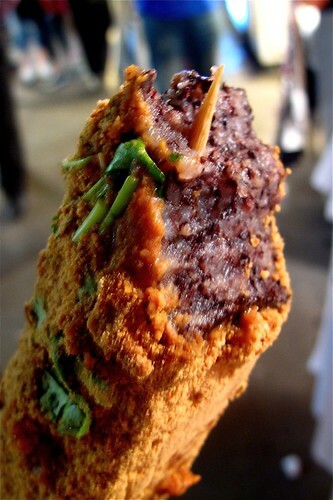 This is definitely one of the most popular and well-known stands at the Shilin night market. Although it's size might be a little intimidating for some, me included, once you take a bite, it'll be hard not to consume all of it. Who knows how many pieces of chicken, breaded in some mysterious concoction that results in a ridiculously crispy, yet chewy crust, is deep fried until golden and dropped into the waiting hands of customer every night. A sprinkling of chili powder adds a spicy kick that only makes it even more addicting. It's delicious and I've never had fried chicken like this anywhere else. Okay, even my bottomless-pit of a stomach gets pretty full by this point in the night. 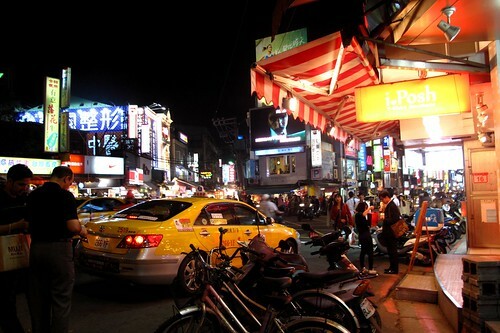 Luckily, there is an endless amount of things to see and places to shop at the night market. I love dogs and there's a row of pet shops that we usually walk by. It's sad seeing them caged up but they're also incredibly cute at the same time. At least they all have street-facing views in their cages I guess. 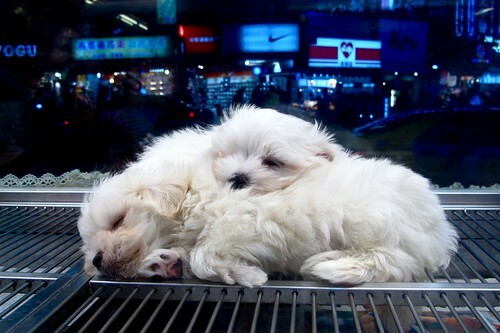 Even if you don't go in the pet shops, you can see them from outside. 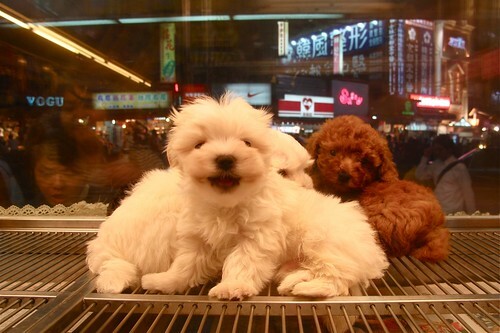 For those looking to buy a little puppy, these little poodles and maltese are actually pretty expensive. I saved the best for last. 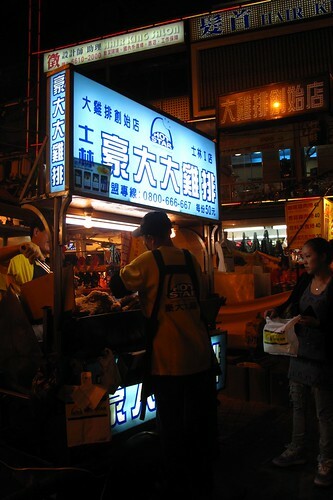 This is one stand you CANNOT miss if you ever visit the Shilin night market. They make scallion pancakes they way they should ALWAYS be made--deep-fried, topped with an egg, and drenched in a delicious sauce. 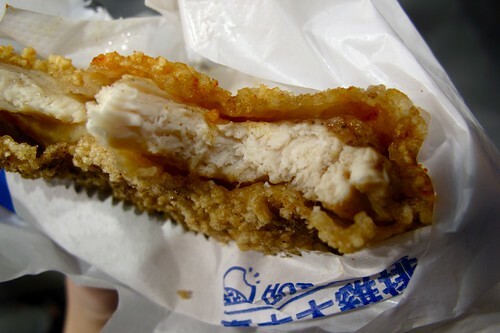 There is nothing better than taking a bite of the crispy pancake, breaking open the runny egg yolk of the fried egg it was topped with, and then taking ANOTHER bite WITH the runny egg yolk. It's amazing how something so simple can be so good. 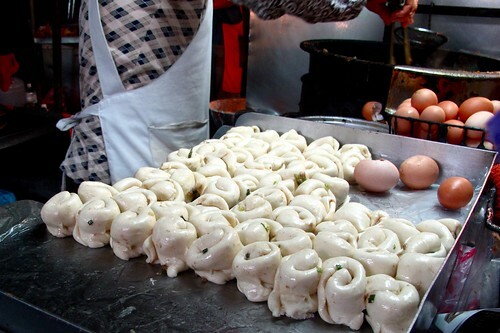 They have trays and trays of dough waiting to be rolled out and immediately dropped into the hot oil along with an egg. I don't know how they get the dough so chewy. It's amazing. I don't know how long they've been using the same pot of oil and I don't want to know. However, the deep golden brown they get on the pancakes kind of indicate that the oil has been around for a while. I have no idea how long this stand has been here. All I know is, my mom loved these when she was young too. They've been featured in newspapers, magazines, etc. Although they were probably dirt cheap a few years back, they are currently about $0.50 for one fried pancake without egg and almost $1 for one topped with a fried egg. Go for the one with the fried egg. You'll thank me with you see the runny egg yolk. As a child, my mom and I made a pact every time we went to the night market: we could eat whatever our hearts desired but we were not, under any circumstances, going to admit any of the eating we did to my slightly more cautious dad. Who knew what kind of bacteria-ridden ice was used to make that delicious, pillowy mound of shaved ice? 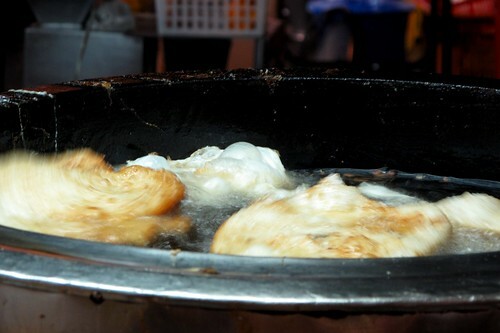 Who knew how long that cauldron of oil has been frying up crispy, golden disks of dough? 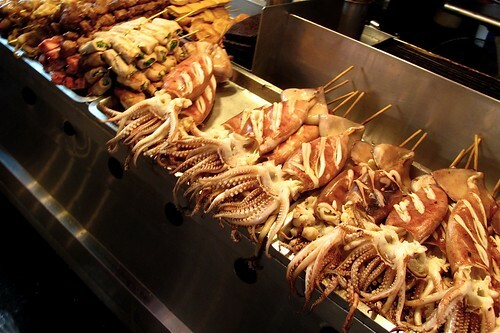 I like to think of the night market as an adventure for your taste buds, and a challenge for your stomach. The food is amazing, the mixture of smells is intoxicating and nauseating at the same time, and while it's origins may be questionable, in the end I say it's worth it. I LOVE THIS POST! So good I am shouting! I wish you could be my guide in Taiwan! I love street food culture in Asia. Must visit Taiwan. MUST! 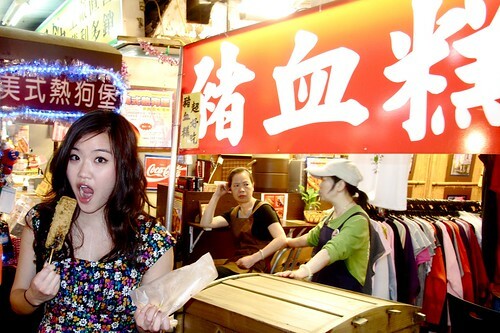 Aww, you are making me miss Taiwan so much! I'm so sad I can't visit this summer. Great post! Thanks for this post! This is very informative and helpful. But as an ABC, my Chinese is pretty rusty. A pronunciation guide for all these street eats would be helpful for when I go back to Taiwan. Ah. 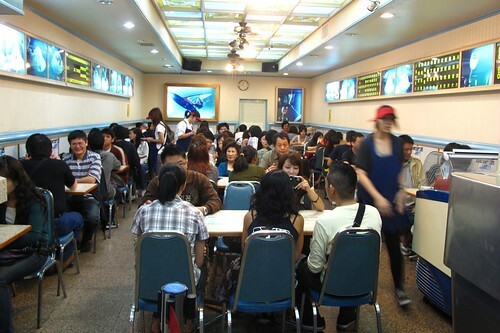 Shilin, the best part is when the cops come and all the illegal street vendors flee leaving the tourists confused. Totally agree on the scallion pancake with egg! I can never tire from eating that. 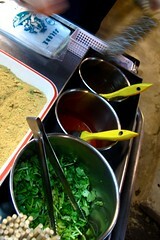 I think the sauce is thickened soy sauce infused with garlic, a staple amongst most Taiwanese "tapas"
@Gastronomer: Yes! Taiwan is fun! @Cookie Chomper: You are right about the sauce :) and it's so good! O yes, o hells yes. Extra hot sauce! Extra cilantro! 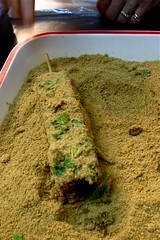 The joints often use soy sauce "paste" so the peanut powder can stick better. Since imported pork isn't allowed in the states, all the domestic stuff we have does not taste the same. How much is that in NTD nowadays? 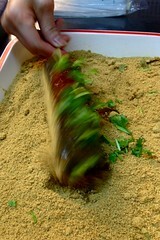 @SinoSoul: Yeah the one I had was coated in soy sauce paste as well. I guess I should change "soy sauce" to "soy sauce paste" lol and it was crazy cheap...maybe like NT20? I don't think I've ever had one in the states. 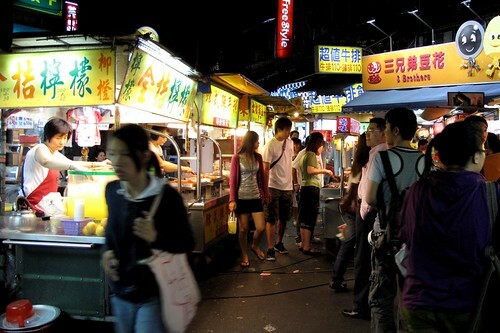 Actually, I don't think I've had one anywhere other than at a night market in Taiwan. I wish there was something like this here in Cali. Ya, people in LA doesn't understand the concept of walking. F. Why did I look at this right now. Awesome post. And it looks like we now know where KFC got their inspiration for the Double Down. Can't wait to go back to Taiwan in t-minus 4.5 years. i totally, randomly found you via thisweekfordinner blog, and i LOVE this post! holy moly! what a great sight!! i think you're the next Food Channel's host for hot spots of the earth! I love Shilin Market, though it's a bit far from where I stay in Taipei so I'd hit up other night markets. 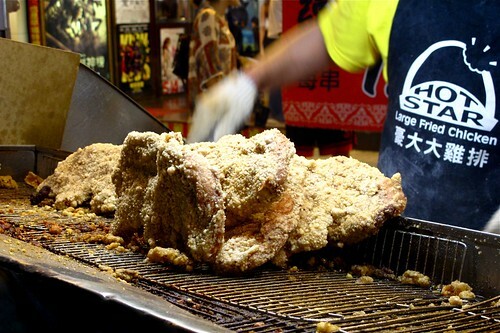 You seriously can't come to Shilin w/o getting the giant chicken patty. 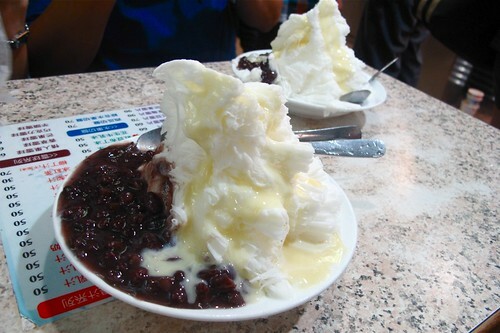 Oh, with shaved snow, I guess the best one out there in LA = Class 302, but sadly it's not as good at Taiwan. Oh, I miss the food and the shopping right NOW!! I'm surprised that there aren't more shaved snow stores in L.A. Pa Pa Walk in San Gabriel is another place although I don't know if it's any good. 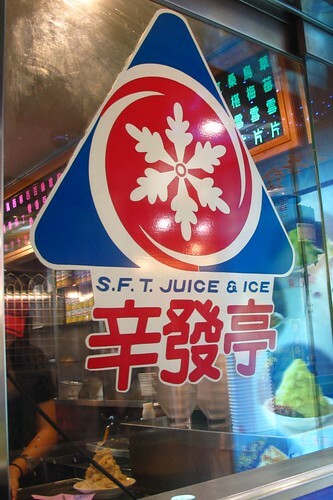 Ahh I had totally forgotten about SFT...been there before but only had a mixed fruit juice. Really good quality. I think that shop has been there over 30 years. My faves are the pork pepper bun, Ay Chung Noodle, and Da Shanghai Shen Jian Bao. Christina, can we exchange blog? Angeline from M'sia. I'll be visiting Taiwan in Oct 27th. Can i know how's the weather in Oct? Great introduction of the night market. Interestingly, I have wrote about the same night market, too. 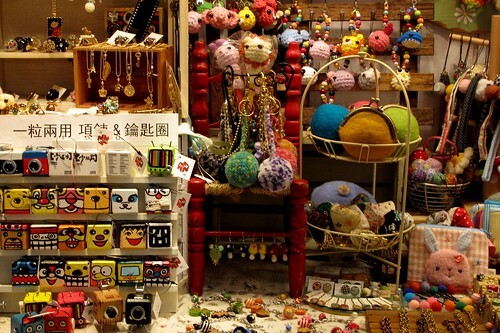 You can read my Shilin Night Market post here. 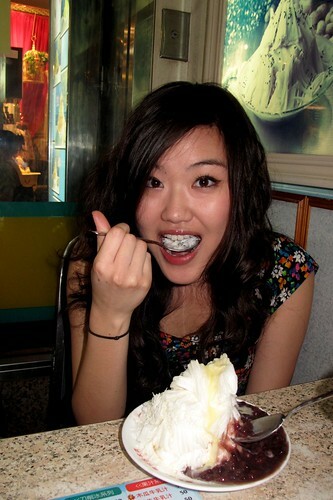 I've noticed that we both had the big chicken cutlet and the shaved ice, hehe. What are the odds? Pretty cool blog you have here. I LOOOOVE this post. It's been a year since I went to study in Taiwan and I miss the place like crazy! Sometimes I crave the Cong You Bing SO MUCH, I want to cry. 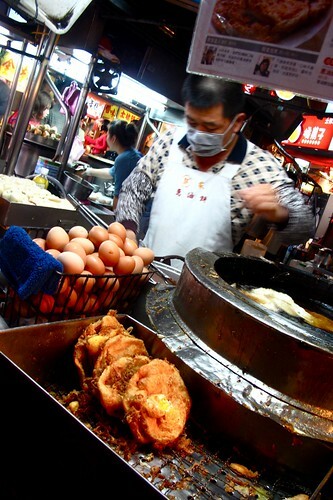 Times like those, I just come back to this post and I'm instantly transported back to the sights, sounds and smells of my beloved Shilin Night Market. It's the next best thing to being back there! This shaved ice... I have GOT to try this! Any idea if I can find this in the US? Or how to make it myself? 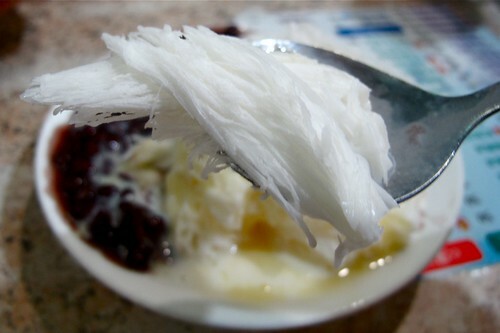 Would you freeze sweet condensed milk and then shave it? But if so, with what... I have to find a way! Thank you for sharing your passion with us.